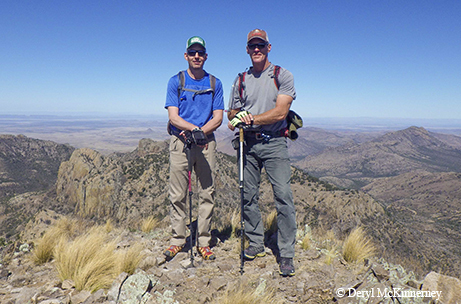 In what could be a first for Texas, outdoorsmen Deryl McKinnerney and Grant Bauer scaled all 10 of the 8,000-foot peaks in Texas in three days at the beginning of April. Eight of the peaks are in Guadalupe Mountains National Park, and two are in the Davis Mountains. The duo spent Day 1 hiking the highest peaks in the state — Guadalupe Peak, Shumard, Bartlett, Bush and El Capitan — and stayed the night on Bush, where McKinnerney’s wife and daughter had set up camp. Day 2 took them to three more Guadalupe Mountains peaks — Blue Ridge, a peak known as 8342 and Hunter Peak. The next day, they drove to the Davis Mountains to bag the remaining two — Mount Livermore and Mescalero, which are on land owned by the Nature Conservancy. The trek covered 38 miles of hiking and an elevation gain of 15,358 feet. The idea came about when McKinnerney, a hunting guide and rancher from the Hill Country town of Tarpley, started visiting the Guadalupe Mountains a few years ago. He and Bauer figured they could tackle all the 8,000-foot mountains in the park. They later decided to add the Davis Mountains peaks to complete the 8,000-foot challenge. They said they could find no records of anyone having climbed all of Texas’ 8,000-foot mountains. McKinnerney says the trek was arduous, but the accomplishment was worth it. Every year, U.S. fishing activity captures, injures or kills more than 250,000 sea turtles. To help change that, Florida’s Loggerhead Marinelife Center started the Responsible Pier Initiative in 2012. By the end of 2015, it included 43 fishing piers in Florida, Virginia, North Carolina, Puerto Rico and Texas. These piers agree to follow turtle-safe guidelines, including recycling monofilament fishing line, posting signs telling fishermen what to do if they accidentally hook a sea turtle and providing a sea turtle responder hotline. Participating piers also have special nets for safely landing a hooked sea turtle, says Joanie Steinhaus, Gulf of Mexico director of Turtle Island Restoration Network, an initiative partner. Texas piers in the program include Horace Caldwell Pier in Port Aransas, Bob Hall Pier on North Padre Island, and the 61st Street Pier, Galveston Fishing Pier and Seawolf Park in Galveston. So far, nearly 5,000 pounds of debris have been removed and more than 100 sea turtles have been rescued at participating piers.